“Today, analytics practitioners influence business decision makers. In the future, analysts will own business decision making.” That is a heavy statement from the #SMX West agenda description for the session I am sitting in right now. You may have noticed this session has a special hashtag — #ms3 — which signifies this presentation is the third session in today’s 11-part Marketing Summit Track. The Marketing Summit Track is special because in this track attendees hear three 25-minute mini-sessions on three different topics during one 1.5-hour session slot, rather than hearing several speakers share on one topic for the full 1.5 hours (which is the standard SMX session format). In this post I’ll cover the third in the 9-10:25 series: Revolutionizing Decision Making: How The Analyst Will Take Over Business. Click the above links to read liveblog coverage of #ms1 and #ms2. Leading us through this 25-minute talk on the “analytics revolution” is Natalie Kortum (@NatalieKortum), director of analytics and consumer insights at Humana. She’s going to be discussing Revolutionizing decision-making. 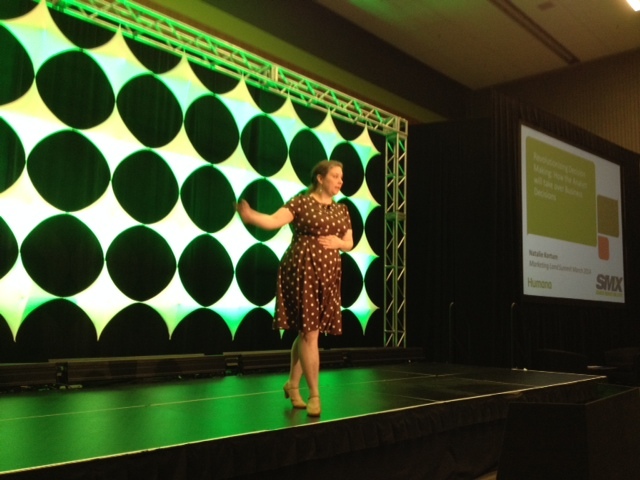 Natalie Kortum speaking at the #SMX West 2014 Digital Marketing Summit. She starts by saying plain and simple Big Data will change analytics (and how we report them) forever. Not only will more data allow us to better connect with our consumers during specific/targeted phases in their lives, it will also allow us come to more statistically relevant conclusions. A lot of data increases our statistical relevance. In Mad Men times we used our gut instinct a lot. Today we use DATA! 1) High level exporting/trends. Generalized data. 2) Key performance indicators; where are we? What metrics represent success? 3) Business intelligence data exploration. At each one of these decisions you need Acceptance – at every stage you need someone to give you buy-in. To approve what you’re doing; to accept your data; to give you a green light to move on to the next stage. The difference between a good analyst and great analysts – getting buy in! What do I need to create a project that continually gets funding quarter over qurter? Year or over? 1) Make sure your data collection meets a strategic business need. By this we mean the business itself needs to find it important. Not the analytics team finds it important; the business leaders need to find it important. Stakeholders need to ask about it in follow-up meetings; they need to be interested in it. 2) Explain the analytics in a way that the stakeholders can understand. How can you explain to your directors — in an accessible way — what the data is saying, and why the data is critical? 3) Demonstrate ROI to stakeholders. How can you improve this data gives you stronger confirmation than a primal instinct, and that the data collection and analysis is worth the investment. 1) Walk a mile in their shoes. What does it the person you’re communicating to need? Ask them! What are your top of mind problems you’re dealing with? What do they need to communicate to their supervisors? What data do they need to give X project value? How can you mine the right data to solve the right problems? 2) Run your presentation past a nontechnical supporter. Seriously. Make sure your nontechnical volunteer understands what you’re saying before you run your presentation by a stakeholder. Another approach is to pretend that you’re giving your presentation to your mother, or your neighbor; will they understand what you’re saying? Only take two-minutes to explain your methodology. 3) Create proof points for your techniques. For example: Are there other markets that are already using a similar approach? Other companies? Other internal resources? Respected industry expert? Can you get examples of their work, or actually get the person in the room with you (if in-house)? Only show two or three if you need to show them. Don’t get them overwhelmed with maybe data. Implement it – but I want to approve final decisions. Implement – but you approve final decisions. Ok. This is working great. Let’s automate it! When developing your speaking skills it’s remember: We all learn from our failures. Keep trying, keep failing, keep learning.